that thy nakedness be not discovered thereon." The prohibition here was to guard from adulterating the worship of Yahweh with that of the pagan Midianite/Moabite god Baalpeor. The priests of Baalpeor climbed their altar steps, and stripped down naked engaging in licentious rites in honor of that fertility solar god. "They offered human sacrifices to him, and erected altars to him, in groves, on high places, and on the terraces of houses." (Dictionary of the Holy Bible, Augustin Calmet - 1832 - page120.) "Baalpeor -Name of a Canaanitish god. A god of the Moabites worshipped by obscene rites. Num 25:3; Num 31:16; Josh 22:17" (Easton's Bible Dictionary 1897). Hosea refers to Israel's participation with Baal-Peor rites as "that shame". (Hos.9:10) The best way to prevent this from happening was to not allow "stepped altars" to ever be built in the first place. In other words, no first step (let alone 91 steps!) as in the service method of Baalism was permitted. "Neither shalt thou go up by steps unto mine altar"
We've already examined several solid Scriptural reasons why the Great Pyramid can not be and is not the altar pillar of Isaiah 19:19 & 20. It is an "advanced" pyramid of those who worshipped the Sun and celestial bodies. The 91st Day quarterly memorial celebrations of the year are certainly within the Great Pyramid's mathematical formulae, as is boasted about by today's 91st Dayers. But the foundation for the 91st Day solar calendar is originally based upon simpler pyramids called "Step Pyramids". They are "family pyramids" to the more advanced Great Pyramid, a pure pyramid. The trouble with the 91st Day concept of all these pyramids is that the actual seasons are not divided into 91 equal day parts of the year. Such is a fabrication that is not even implied in the Scriptures much less told directly to us. Due to the earth's elliptical orbit it is 186 days from the Vernal Equinox to the Autumnal Equinox, and only 179 days from the Autumnal Equinox back to the Vernal Equinox. ( reference: U.S. Naval Research Laboratory) Yahweh's Sabbaths and Feast Days are not hidden in-between the lines of any Bible verses. They are plainly told to us and clearly numbered . That is why you will never find a single Bible verse which tells us "to count 91 days" to any month or other part of the year on which to hold a Sabbath, a Feast, a supposed Marker Day, or a supposed Gate Day. This is because the Scriptures live in the reality of what Yahweh has made, and His seasons are not evenly divided within the year. The ancient heathen priests had divided the seasonal day count as only approximately 91 days apart because they were more concerned with magic in numbers than true astronomical facts, as well as incorporating that 'number magic' within their stepped pyramids and true (pure) pyramids. These two types (step pyramid and pure pyramid) of calculating a solar calendar based on partitioning the year into 91 day sections, were both tied to celestial divination. The previous study page graphically showed the relation of the placement of the Great Pyramid and its accompanying Pyramids to that of the constellation Orion. Orion's influence on the Pyramid ground plans is heathen religion in nature and purpose. Although the ancient astrologers "saw gods" in many planet/star bodies of light, the other constellation that played a significant part in their beliefs was that of the constellation "the Pleiades" upon which the 91st Day calendar aspect was founded. Yes brothers and sisters ---- the 91st Day Solar Calendar concept is born right out of the SERPENT RELIGION of the multicultural ONE WORLD ORDER seen all over the globe. Just because it's "solar" does not mean it is of Yahweh. The 91 steps were climbed by the priests at certain times of the year representing the Mayan travel through the seasons of 364 days. The top of the pyramid was day # 365, thus a complete journey to the "gods". Human sacrifices were a regular part of the religion. 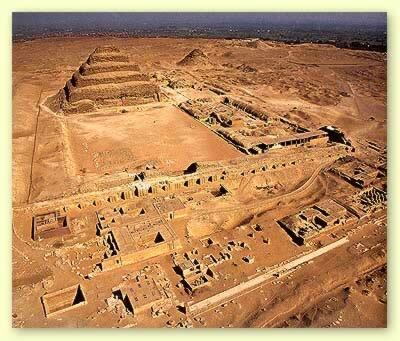 There are step pyramids and other pyramid structures dotted across our planet dating back many thousands of years. They are all tied together mathematically to the constellations of Orion (Osiris), The Pleiades, and the Sun. The Moon, when it appeared, was an object of pyramid worship as well. Whatever race was dominating the earth in those eras long ago was doing it on a world wide communal basis of a state religion. It is quite probable that somehow the Egyptians and other heathen races resurrected a "mystery school" of pyramid computation from yet earlier times, either from written records which they unearthed or from a few survivors of that knowledge. It is not the purpose of this study to expound on that particular premise. It is enough just to say that it was evil. 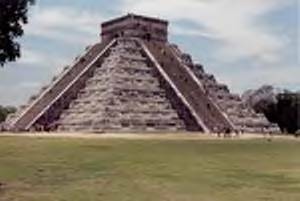 The Great Pyramid of Egypt is astrology based upon the constellation Orion, while it's sister Pyramid Kulkulcan in Mexico is astrology based on the constellation Pleiades (the seven stars). Yahweh Almighty mentions these two constellations together in the Scriptures. into the morning, and maketh the day dark with night. In other words Yahweh is telling Job that only He holds power over these constellations and only He can bind or loose any "influence" they may hold. These constellations brought with their arrival in the sky the blessings or hardships of the changing seasons. Pleiades is a Spring constellation that was accompanied by the warmer weather which germinated the seed crops for abundance. Orion is a constellation that appears with the approach of winter and is known to bring the hardships of cold stormy weather. Yahweh alone controls their positioning and the times of their appearance in the night sky. Neither of these constellations are "gods" that can be invoked by numerology of mathematic manipulations, or invoked by building great architectural structures to them as did the 91st Calendar Day Mayan and Egyptian priesthoods with their Pyramids. It is by a warning against the religion of these 91st Day seasonal Pyramids that Yahweh gives a stern admonition to Israel to not be involved with them in any manner. The astrological world religion had been in existence for unknown ages before the days of Moses and the Exodus --- so long in fact that Yahweh reveals that not only are some relics currently on the Earth's surface, but that some have been long buried in the ground by time, or at the bottom of the seas. Israel is not to be copying any of these which they may dig up in the Earth, or discover below in the waters. They were not to build an altar to Yahweh patterned after any 91st Day Step Pyramid or any Pyramid employed in constellation and Sun observations of the heavens. 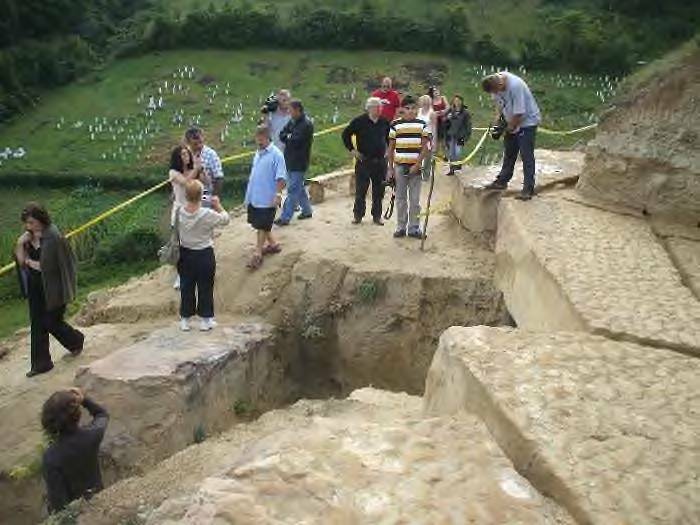 (3) or that is in the water under the earth"
This pyramid discovered in Bosnia, Europe has so many attributes similar to the Pyramid of the Sun in Teotihuacan, Mexico, that researchers and excavators have called it the Bosnian Pyramid of the Sun ('Bosanska Piramida Sunca'). Other pyramid structures have been found close by, the Bosnian Pyramid of the Moon ('Bosanska Piramida Mjeseca'), Bosnian Pyramid of the Dragon ('Bosanska Piramida Zmaja'), Bosnian Pyramid of the Love ('Bosanska Piramida Ljubavi') and Temple of the Earth, ('Hram Zemlje'). How many other ancient Baal/Osiris pyramids are buried beneath the Earth's surface? In March 1995, Japanese divers off the coast of Japan discovered large underwater man made structures. They have been revealed to be a stone ancient city complex suggested to date back to 8000 BC. These sites are under research by Professor Masaki Kimura, marine biologist of the University of Ryukyus in Okinawa. 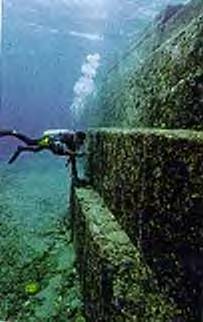 Searching the Pacific island waters for more ancient civilization links, a huge underwater pyramid was discovered a few months later off the shore of Yonaguni, an island 300 miles south of Okinawa. As our technology increases we are at a stage where we are becoming more aware of our surroundings and of Earth's past. More evidence of yet other "lost" pyramid structures are appearing in areas of pending investigation such as the sunken roads and pyramids off the coast of Cuba (see http://www.rense.com/general10/pyramidsroads.htm ) Yahweh has known about them all the time, knows what they were originally used for, who built them, and what happened to the builders. The rule of thumb He has given Israel concerning them is "hands off for your own good -- whenever and wherever you find them". We may not know the specifics about the world web of pyramid structures that predate and include Egypt, but if we trust our Heavenly Father, the old adage "if the shoe fits, wear it" comes to mind. They were constructed in violation of Yahweh's commandments against making hewn stone altars, copying heavenly images, they were heathen religion in practice, they were step climbing objects of worship, they viewed symbolic magical numbers in dividing the seasons more important than the real natural seasons, and the Illuminati to this day still cherishes the sign of the pyramid as a symbol of its New World Order control over the masses. The 91st Day Solar Sabbath people have stated that our solar calendar as presented on this web site is incorrect being "manipulated and forced" to make it only appear to fit the Bible Sabbath and Feast Days. But what shoe is fitting where? Who has brought back from the grave a 91st Day pyramid sun calendar system patterned after the Egyptian and Mayan heathen religions and teaching the flock of Jesus Christ that this is of Yahweh? Let the reference material presented herein as related to the Bible be the evidence. Read on and decide for yourself, as there's yet more.